Eighth Avenue is the main drag in Sunset Park's Chinatown. In this recently launched Brick Underground column, we celebrate the immigrant enclaves that make our city the vibrant metropolis it is. We're proud of our melting pot—a mixture of cultures, languages, and customs from around the world. This time, we're exploring Chinatown in Sunset Park, Brooklyn. 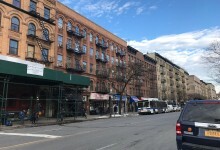 When Renee Giardino, executive director of the Sunset Park Business Improvement District, bought her house in the Brooklyn neighborhood 30 years ago, “Eighth Avenue was almost entirely lined with empty stores.” Now that avenue is the hub of Brooklyn’s incredibly vibrant, 24/7 Chinatown, the largest Chinatown in all of the five boroughs. “It really has transformed our community,” she says. 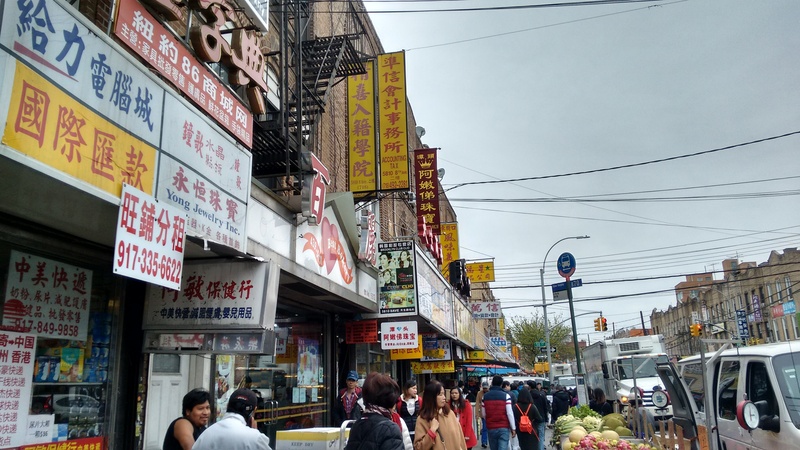 Not everyone agrees on what the boundaries of Sunset Park’s Chinatown are, but one thing everyone agrees on is how the boundaries are steadily expanding and now reach far beyond Eighth Avenue. 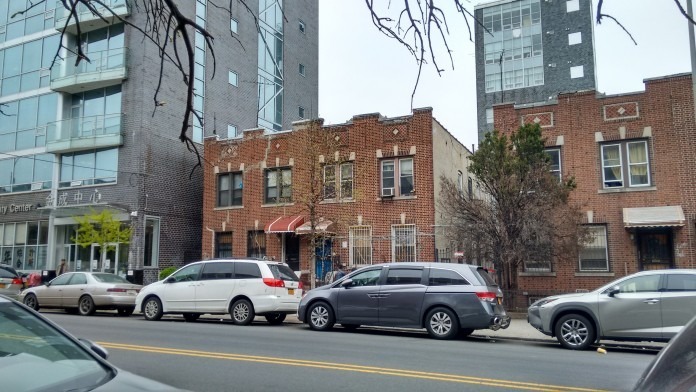 According to Steve Mei, director of Brooklyn Community Services for the Chinese-American Planning Council, the neighborhood roughly runs from Fifth Avenue to Ninth Avenue and 40th Street to 68th Street—an impressively large swath of Sunset Park. One of the reasons that Eighth Avenue (pictured below) takes pride of place in the community is that the number eight is a particularly lucky number in Chinese culture, says Mei. It signifies prosperity and success, making it a perpetual favorite of Chinese who are establishing businesses. To emphasize the importance of Sunset Park’s dominance as the largest Chinatown in NYC, a Friendship Arch, donated by a borough of Beijing, will be erected on Eighth Avenue and 61st Street in the fall of this year. 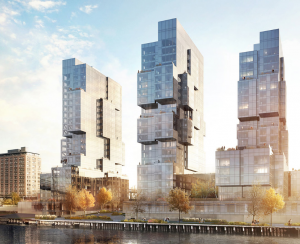 “We’re planning on September,” says Raymond Chan, the architect in charge of the project. Chan says that the arch will combine the ornate, classical style elements of Friendship Arches in other cities with new technology—”it will be solar powered." 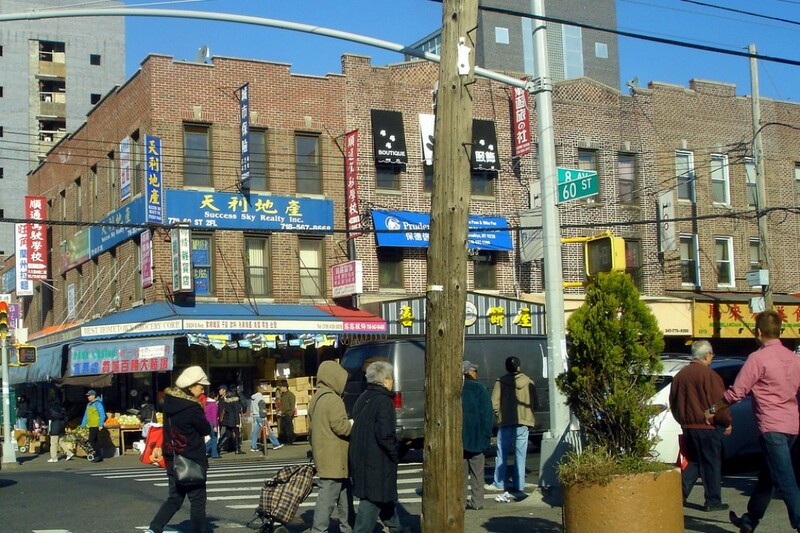 Why did so many Chinese immigrants choose Sunset Park? Sunset Park was a logical destination for the Chinese who were being crowded out of Manhattan’s Chinatown 20 years ago. Rents were climbing and space was running out in that narrow slice of the borough. In Sunset Park in the 1990’s, residential and commercial rents and purchase prices were relatively low and there was plenty of room to grow. 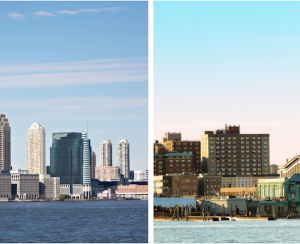 In the first two posts of our series on immigration—one on Little Senegal in Harlem, the other on Little Manila in Woodside—two issues stood out as being the biggest concerns for those communities: housing and the current administration’s immigration policies. Sunset Park’s Chinatown is no exception. 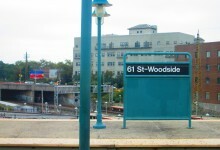 Carlos Menchaca, who represents Sunset Park on the New York City Council, understands these concerns and has set up a satellite office on Eighth Avenue where Kaden Sun, director of Asian American Affairs, offers advice and assistance to residents, especially to those who know little or no English. Sun knows the community well, having lived in Sunset Park for 20 years. Many of the people who seek guidance are frightened about the possibility of deportation and are susceptible to rumors —many unsubstantiated—about ICE raids on businesses. “ A lot of people are scared and asking for help,” he says. They ask for legal assistance and help with applying for IDNYC cards, as well as to find out about the fastest the path to citizenship. Housing is another issue that worry his clients. “Affordable housing is a big concern," he says. "Many of the people who come into our walk-in center ask about help applying for NYCHA housing.” According to StreetEasy, the median asking rent in Sunset Park is $1,900, while the median sales price is $453,000. By comparison, Park Slope, the neighborhood directly north of Sunset Park, has a median sale price of $930,000 and a median asking rent of $2,750 while Bay Ridge, just south of Sunset Park has median prices of $360,000 and $1,850 respectively, according to StreetEasy’s calculations. One of the biggest and most anticipated events in Sunset Park is the Brooklyn Chinese-American Association’s Lunar New Year Parade which began in 1988—”this joyous celebration held on a dreary street brought together people of diverse ethnic backgrounds and successfully marked a turning point for Sunset Park,” according to the group’s website. The street life along Eighth Avenue is lively and varied: We also saw a shoemaker sitting on a folding chair near the curb, measuring a client’s foot. “If I had more time on the weekend, I’d love to just walk along Eighth Avenue," Sun says. 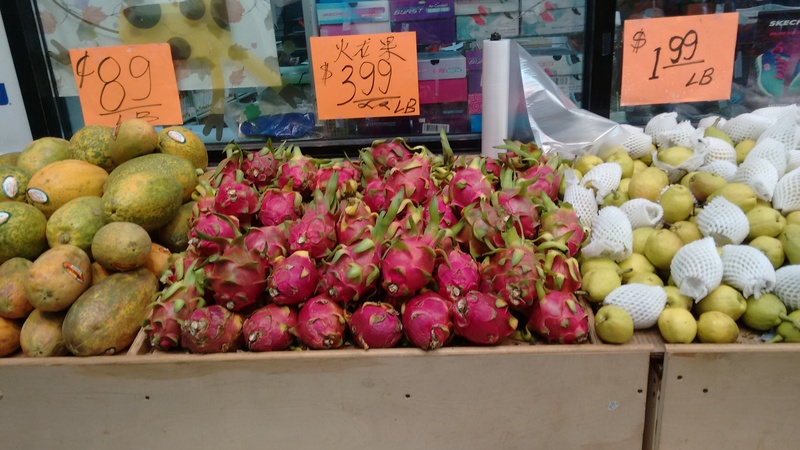 A visit to a Chinese supermarket is another treat for anyone new to the neighborhood. Not far from the N line's Eighth Avenue stop, on 60th Street and Eighth Avenue is the bustling Food Mart, a supermarket with that practically unheard-of NYC feature—a parking lot. The produce at Food Mart is fresh and abundant and there’s a huge variety of Chinese products on the shelves along with foods from other Asian countries as well. Most visitors to the area want to try the Chinatown dim sum restaurants and there are plenty to choose from. Mei says that the residents are all working hard and long hours and have little time for weekday dining, but on Sundays, dim sum restaurants are packed with families. Two he recommends: Park Asia, 6521 Eighth Avenue which is two floors of recently renovated space that Michelin describes as “lavish” which serves “well-executed Chinese dishes." Park Asia is a popular spot not only for family dim sum get-togethers but also for community events, small weddings and showers. His other favorite is East Harbor Seafood Palace off of Seventh Avenue at 714 65th Street. East Harbor is Sun’s dim sum pick as well—even though when we asked him to name his favorite neighborhood restaurant, Sun said it was Tacos El Bronco at 4324 Fourth Avenue, quite obviously not Chinese. “My wife and I love it," he says. If you're looking for something a bit smaller and more intimate than a dim sum banquet palace, Mei likes the barbecue meat dishes at Lucky Eight, at 5204 Eighth Avenue. 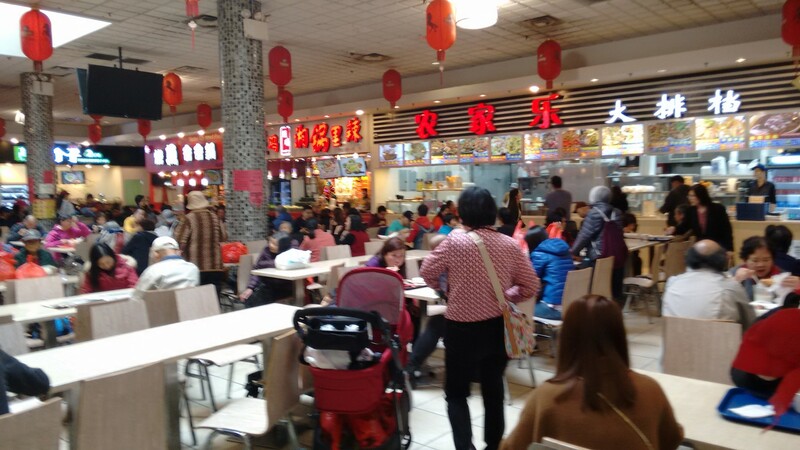 Or for something completely different, try the Fei Long Food Court at 6301 Eighth Avenue (pictured below), inside the Fei Long (Flying Dragon) Supermarket. Edible Brooklyn says it’s the home of “some of the city’s best dumplings, roast pork and noodle soups.” If you don’t speak Chinese you’ll need to do a lot of pointing and pantomiming when ordering but it should be worth the effort. There are plenty of tables and on a recent early lunch hour, they were pretty packed. New development is everywhere, reports Mei. “When I look out my window I see condos popping up.” For starters, there's the massive reshaping of the waterfront and the arrival of Industry City (outlined here by Curbed), as well as, yes, an influx of luxury projects, that, though not quite in Chinatown proper, is bringing lots of newcomers to Sunset Park. Chinatown, too, however, is seeing lots of new projects: The Brooklyn Eagle walked through the neighborhood and found a number of them mid-construction. Old and new side by side in Sunset Park. 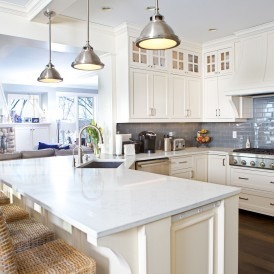 And then there's the constant churn of resales and smaller development projects: Mei explains that when people first arrive, they usually move in with their sponsoring family—it’s often a tight fit. 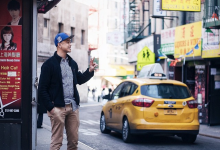 Young people live three, four, or five to a room.” Several of the more established neighborhood Chinese residents who have prospered in business here and others who reside in China, are attracted to the possibility of investing in New York City property. They often buy single-family homes, tear them down, and build multi-family condos or rentals in their place. 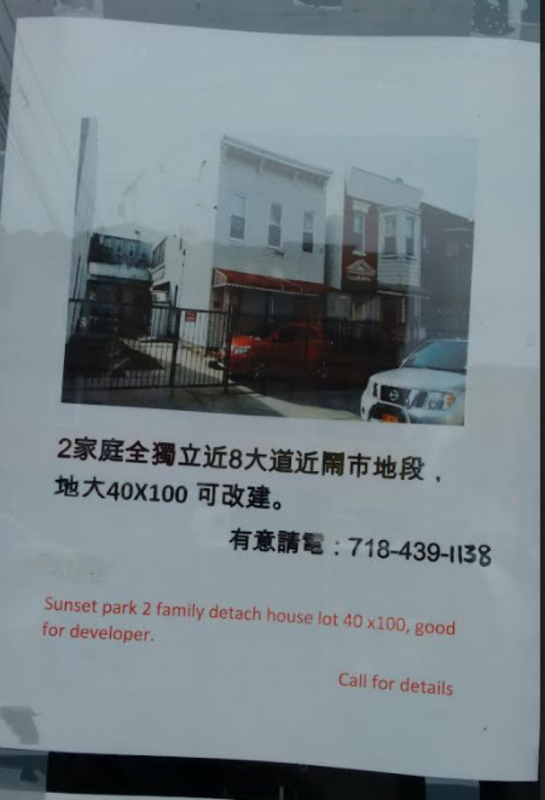 An ad for a real estate listing in Sunset Park. Note: "Good for developer." 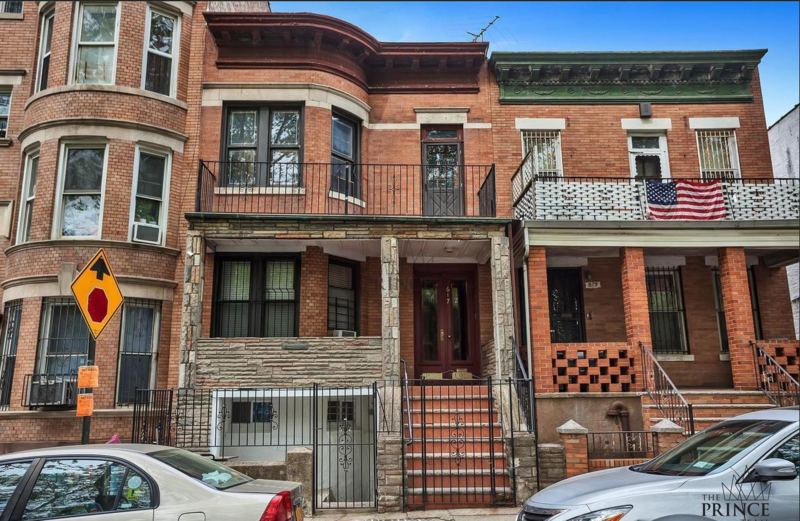 A two-family brick house (pictured above) built about 100 years ago with 3,400 square feet is for sale now. The property can, according to the listing, be easily converted into two duplexes or a single family. “Call your architect,” suggests the ad. 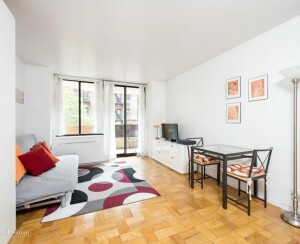 It’s at 617 41st Street, between Sixth and Seventh Avenues, and is just under the million dollar mark at $999,999.